Home › What is Marburg virus disease › What is leptospirosis - Leptospirosis in humans (Weil's disease). Leptospirosis is a highly infectious zoonotic disease caused by the Leptospira bacteria affecting humans and animals. 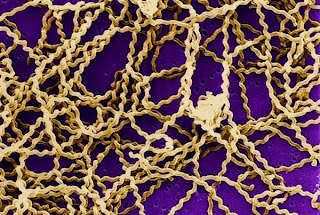 Icteric leptospirosis in humans is known as Weil's disease. It may also appear as an asymptomatic and subclinical infection. Leptospirosis symptoms range widely and are usually ignored or wrongly diagnosed as some other human sickness. Untreated infection can become icteric, leading to hepatitis, meningitis, renal failure, respiratory failure, pulmonary hemorrhage, and even loss of human life. The disease is more prevalent in tropical, subtropical and temperate climates. Leptospirosis is caused by the spirochetes (spiral bacteria). The spirochetes belong to the genus Leptospira, the family Leptospiraceae, and the order Spirochaetales. These anaerobic bacteria are thin, coiled and motile. Comprising several pathogenic and nonpathogenic species, typical disease manifestations in humans such as Weil disease, jaundice, pretibial erythematous rash, meningitis and gastroenteritis are associated with different serovars (strains). The bacteria can enter the human body through the contaminated water and food, skin injuries, animal bites and mucous membrane. The bacteria spread to humans through the urine, feces or body fluids of the infected animals. They can infect a wide variety of domestic as well as wild animals, which not showing any symptoms of the disease, may continue to shed the bacteria into the surroundings for months together. These infective discharges, by contaminating the drinking water and food, can spread the infection to humans and animals. Floodwaters have been found to spread the disease far and wide and cause leptospirosis outbreaks. Human occupational exposure to infected animals can also spread the bacterial disease among farmers, veterinarians, fish farmers, dairy workers, abattoir workers, sewer workers and animal caretakers. People associated with water sports like, swimming, kayaking, rafting run the high risk of contracting leptospirosis, if the waters are polluted. The incubation period is usually 5-14 days but in some cases the symptoms have taken 2-30 days to develop in humans. The common clinical symptoms of the infection include, fever, headache, body pains, dry cough, rash, sore throat and chills. Gastrointestinal tract symptoms include anorexia, nausea, abdominal pain, vomiting, and diarrhea. Untreated leptospirosis may cause many systemic manifestations in humans, mostly by capillary vasculitis of the organ systems leading to hepatic failure, renal failure, pulmonary hemorrhage, respiratory failure, meningitis, interstitial myocarditis, adrenal hemorrhage, conjunctival suffusion and thrombotic thrombocytopenic purpura. Mild infections in humans can be treated with doxycycline, ampicillin, penicillin, azithromycin, erythromycin or amoxicillin. For severe human leptospirosis, third-generation cephalosporins like cefotaxime and ceftriaxone may be administered. Intravenous penicillin G is also effective for mild to severe cases of infection. Blocked tear ducts in newborn. Loud music and hearing damage. 1.Vijayachari P, Sugunan AP, Shriram AN. Leptospirosis: an emerging global public health problem. J Biosci. 2008 Nov;33(4):557-69. 2.Puliyath G, Singh S. Leptospirosis in pregnancy. Eur J Clin Microbiol Infect Dis. 2012 Oct;31(10):2491-6. 3.Wasiński B. Leptospirosis--current problems. Przegl Epidemiol. 2011;65(3):471-6. Current topic in health and fitness tips: Leptospirosis in humans (Weil's disease).